In Pursuit of Jubilee is about a businessman who rose to the challenge and initiated an effort that would result in one of the largest discoveries of premium grade oil on the African continent. It was the opportunity of a lifetime. 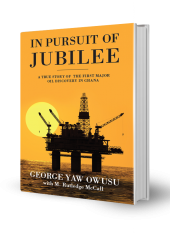 Yet, even before a drop of oil could be pumped, a firestorm would ensue when the new government of Ghana launched a criminal investigation of George Owusu, bringing the nation's fledgling oil industry to the brink of chaos and plunging his life into a nightmare. This riveting story answers many of the questions from George's point of view and captures how one man, upon whom the nation had bestowed its most coveted award, becomes a target, overnight.